You might have seen the abundance of energy drinks around, like ‘Rockstar,’ ‘Monster,’ and of course ‘Red Bull.’ Some of these energy drinks contain guarana, along with other ‘stay-awake’ chemicals. The thing you might not realise, however, is where guarana comes from, what it is and that it’s the main ingredient of a delicious Brazilian soft drink that, believe it or not, is actually quite popular with those who like exotic, tropical flavours. Guarana is a fruit that is native to Brazil, and comes from a plant related to the maple tree. The fruit is rather odd-looking to many who are unfamiliar with it, in that it appears like a bizarre ‘eye.’ The fruit pulp is white, and the seed is the size and colour of a coffee bean. It is the seed that is used in both the soft drink and in other products. 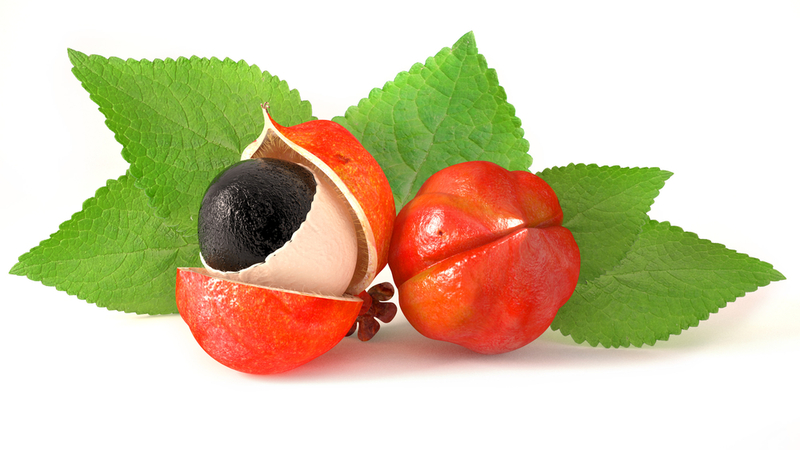 There is a common story associated with the guarana plant. It is said to have been created from the left and right eyes of a village boy that was killed by a malevolent deity. A benevolent deity, in an effort to console the villagers, took the left eye of the boy and created the wild variety of guarana, and used the right eye to create the domestic variety. Guarana is thus also known as ‘fruit like the eyes of the people,’ as translated from a word in the Tupi-Guarani language. Guarana, or more accurately, the guarana seed, contains more caffeine than actual coffee, along with caffeine’s close cousins, theobromine and theophylline. So if you truly want something to wake you up, consume something with guarana in it, rather than just drinking coffee. That said, if you are sensitive to caffeine, this might not be a wise idea, as drinking a lot of guarana can boost your heart rate too much, among other issues. People who have consumed energy beverages such as ‘Monster,’ ‘Rock Star’ or ‘Red Bull’ will find actual guarana soda a bit unusual, and even better-tasting than the energy drinks they’re accustomed to, or have at least tried. Why? It’s because guarana-based soft drinks only contain the exotically-flavoured guarana extract, and not the taurine that often turns some people off to energy drinks in the first place. If you’re one of those people, try giving an actual guarana soda a try, such as ‘Guarana: Antarctica’ or even ‘Guarana Jesus.’ You’ll find that guarana soda might be more palatable to you, since there is no strong-tasting taurine to block the actual flavour of the guarana extract. Also, if you’re trying to cut back on sugar content, guarana-based sodas are the way to go, as there is no extra sugar added as there is with energy drinks. Guarana may be a strange Brazilian fruit, but it is the basis for a truly delicious and popular soft drink among those who have tried it and love its exotic tropical flavour. Previous post What’s Acai? And What Are Its Benefits?